According to research carried out by OMI, Fortune 500 companies as well as other global agencies face a serious skills shortage when it comes to digital marketing. The report surveyed 747 executives from amongst the Fortune 500 companies, on the state of play with regard to digital marketing skills and training. The study highlighted company executives are unhappy, with the current pool of digital skills and social media talent among the teams and recognize that there is a huge gap that is hurting employee retention and sales. An examination of the infographic, reveals eight important skills that are keeping Fortune 500 talent bosses up at night. These include analytics, content marketing, mobile, social media, email marketing, marketing automation as well as SEO and digital advertising. 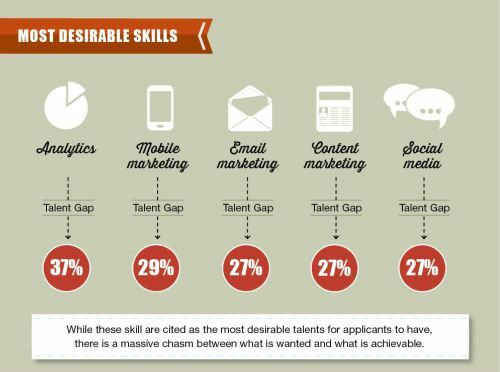 Key findings of the report suggest that there is a large talent gap, which is actually a difference between the digital marketing skills your team should have and the skills they actually possess. A whopping 71% of large companies believes that the digital team is drawn with some specialties but weak with others with sizeable gaps identified. Large brands seem to prefer analytics and mobile marketing as they most coveted digital marketing skills. As mobile technologies are set to be very important to the advertising will in 2014, it is no surprise that 50% of those surveyed, identified mobile as an important skill, but only 29% believed their talent is better a stronger than competing teams. Digital agencies on the other hand identified their most coveted digital marketing skills as mobile, analytics, and marketing automation. The report suggests that board brands and agencies can actually capitalize on the skill shortage with better training and hiring, after all it goes without saying the better equipped your digital team who are perhaps among the most important employees in the organization the better the return and overall wins will be. You can download your copy of the 27-page study titled the State of Digital Marketing Talent here. I observes that agencies are not as confident on their talents as it appears. I suppose the bottom line is that internet marketing is a very rapidly evolving field in which you never know to what extent you are really an expert, and specially, the fact that there are so many variants that one need to be aware of. Anyway it is very exciting for the people hunting careers in Digital Marketing to see this encouraging data. Thanks! I like this as an end-of-year planning stimulant, both personally, and for client firms I consult with! I’m late to the party on this one, but this is a great piece. I am having a hard time hiring for skills that are “net new” to the organization. The new skills come fast and I need to absorb them. It’s always tough to vet the candidates when they know more than me. It’s easy for them to know more than me. It’s hard for me to tell which one is the best in the pool at times. The biggest gap I see is in bridging the creative with the analytic aspects required for the killer projects of the day. So, when this post says people look for “social media skills” or “mobile skills” does that mean the art side, the data side, or the whole package? Quite liked the publication @HaydenARichards. Very useful to set some ideas.